You always hear about werewolves. I didn't know werehyenas existed. They sound far more interesting than the shapeshifters we often read about. Common in legends from Morocco to Angola, werehyenas are the North African equivalent of the werewolf. In Ethiopia, it's traditionally believed that every blacksmith, whose trade is hereditary, is a wizard or witch with the power to change into a hyena. 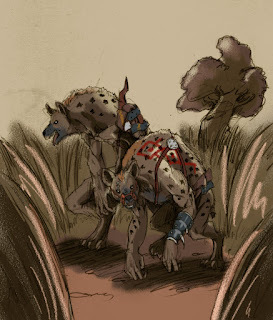 These blacksmith werehyenas are believed to rob graves at midnight and are referred to as bouda (also spelled buda). They're viewed with suspicion by most countrymen. 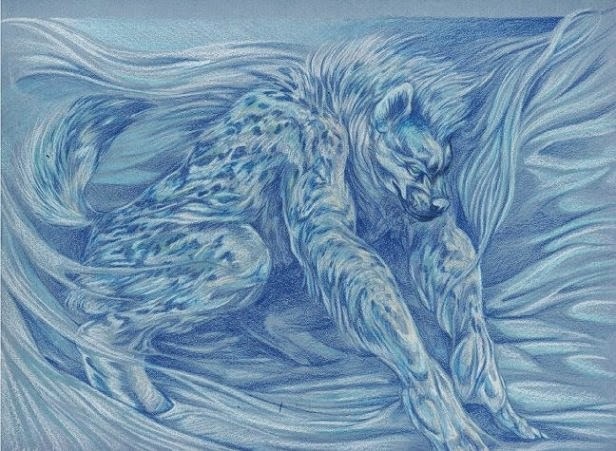 Belief in the bouda is also present in Sudan, Tanzania and Morocco where some regard the bouda as a man or woman who nightly turns into a hyena and resumes human shape at dawn. They're cannibalistic monsters that terrorize people, especially lovers. Unlike their werewolf counterparts, they don't need a full moon to transform. It is said the bouda has the ability to mesmerize victims with its eyes or with its pheromones, which sends their victims into a hypnotizing trance. It's more common for a female to transform, than male. Women are the alphas of the pack, but this varies by region. In human form, they're portrayed as a powerful healer, blacksmith, or woodcutter, but recognizable through signs like a hairy body, red and gleaming eyes and a nasal voice. Those transformed into such hyena men and woman and children are said to be different in appearance from a normal hyena in the wild. They're always described as huge sometimes hairless except for a tuft of hair on the upper back. They walk or stand on their back legs. Their large golden eyes glow red right before they attack, and they have a strange rotted corpse smell that alerts you that they are near. They're also known to bury their half dead victims alive and come back and feast upon them at their leisure. Another take on this legend are the creatures called hyena men. They have two mouths were they can talk and eat at the same time. They have a never ending appetite and are always looking for their next meal. A magician can make them from a person who has tasted human flesh. They tend to abide by cemeteries and eat the dead but they also prey on the living. Some appear handsome while others appear strange and have the smell of hyena in their human form. To catch one, one must lay down a naked beautiful woman whose sight will captivate the Hyena Man with lust. At this moment they are vulnerable to an attack. 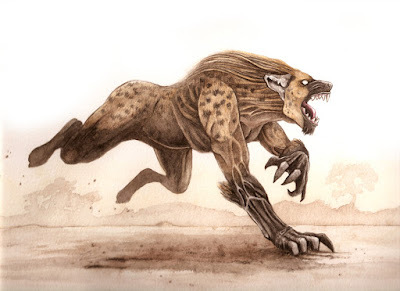 The haunting laughter-like calls of the Spotted Hyena inspired the idea in local cultures that they could imitate human voices and call their victims by name.